Every once in awhile I like to inject a little culture into the blog by sharing some interesting and strange art that has a paranormal twist! 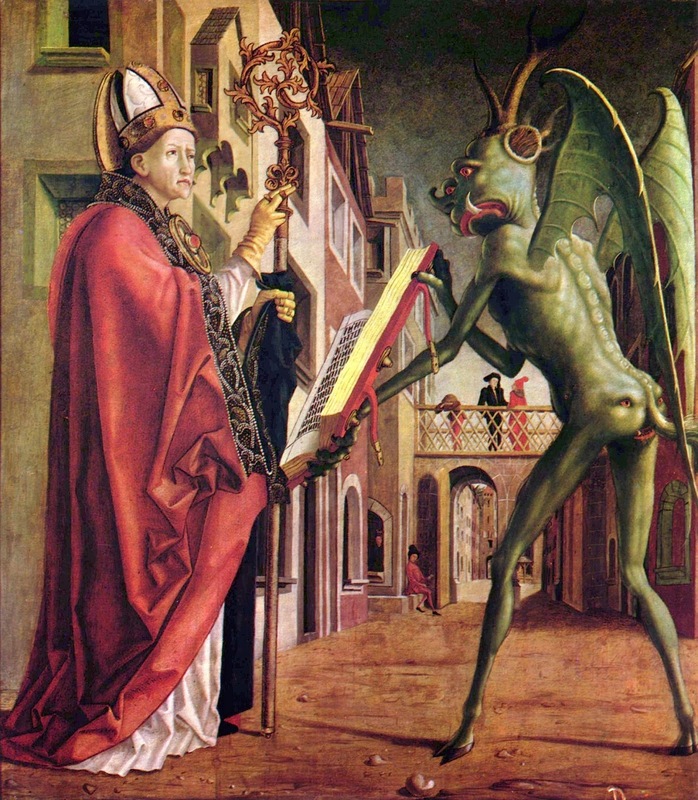 Today's offering is a painting by Michael Pacher entitled, Saint Wolfgang and the Devil (ca. 1475). This painting originally appeared as an altar piece in a church located at St. Wolfgang im Salzkammergut, Austria. Legend states that St. Wolfgang founded the first church in this area by throwing an axe down a mountain and building where it landed. And, as this painting depicts, St. Wolfgang even tricked the Devil himself into helping with the building labor. The Devil was promised the first living being to set foot in the church in exchange for his work. Unfortunately for the Devil, an expected human 'offering' actually turned out to be a wolf! Pacher's work shows the Devil trying to argue his case with the soon-to-be Saint who just swindled him. Today, this piece is on display at Alte Pinakothek in Munich. why is this also named 'The Devil Presenting St. Augustine With The Book Of Vices'?